More than FOUR of every TEN households in Florida can not afford the cost of living. ​With our Community Assistance for Ramadan & Eid (C.A.R.E.) program, the Muslim Women's Organization (MWO) strives to provide numerous opportunities for women and their families to bring ease and joy to those in need by giving back to the community during our blessed month of Ramadan. Beginning with distributing C.A.R.E. Packages full of Ramadan food essentials before the month begins, continuing by feeding the homeless during Ramadan, and ending with an Eid Gift and Clothing Drive. Since 2012, the MWO has coordinated CARE projects annually. From assisting 99 families in the first year to assisting 500 families in 2018, the impact has multiplied. C.A.R.E. has grown to a movement of hundreds of women partnering with over 15 Islamic institutions and organizations to give their constituents not only food packages, but also zabihah meat, Eid gifts for their children, and Eid clothes for the whole family. Every C.A.R.E. Package is filled with a 10 lb bag of rice, a gallon of oil, box of dates, breakfast foods, dinner items, and more. CARE Packages also contain 10 lbs of chicken and 5 lbs of ground beef. 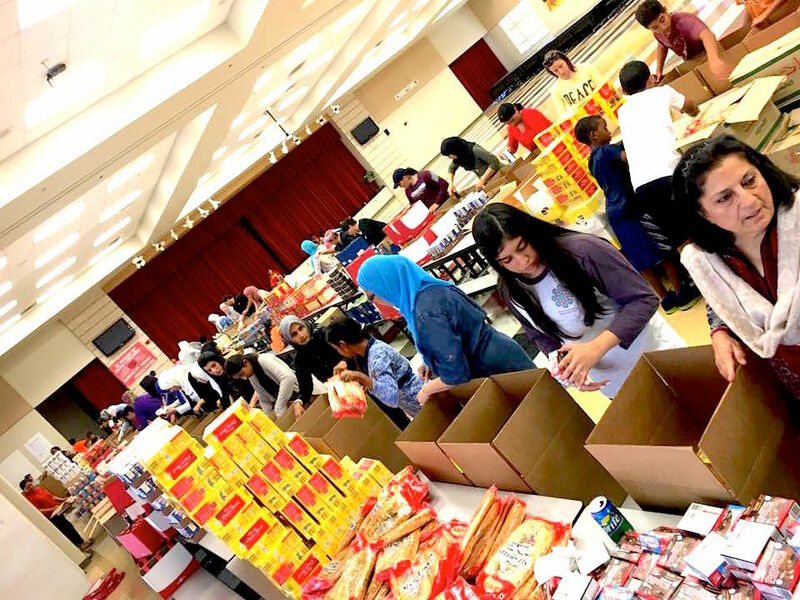 Packages are requested by Central Florida's Islamic institutions and social service organizations who in turn give them to their Zakat-receiving constituent families. With your help, we aim to again bring ease and peace to 200 families this year. Total cost of meat is $5,000 for 200 packages worth $25 each package. Total cost for food packages is $10,000. CARE Package recipients have the opportunity to request Eid gifts for the children in their families. MWO members and the community-at-large sign up to receive the first name and age of a child to purchase a gift for, or make a donation of $20/child. Parents pick the gifts and give them to their children to make the Eid holiday extra special. With your help, we aim to provide 200 presents and a treat this year. Total cost for the Eid Gift Drive is $5,000. Throughout Ramadan, the women of the community donate their family's new or like-new formal clothing. When families arrive to pick the gifts for their children, they have the opportunity to select beautiful formal Eid attire for their whole family. Along with clothing donations, funds are needed for items like clothing racks to set up the distribution. Total cost for the Eid Clothing Drive is $300. Our goal is to provide assistance to 200 Central Florida families in need this Ramadan. To achieve our goal, we aim to collect $22,000.00 for this project. DONATE: Every dollar makes a difference. All donations are tax deductible and zakat eligible. To make zakat-specific donations, email madiha@mwo-orlando.org. PURCHASE AN EID GIFT: Sign up to bring joy to a child this Eid by clicking here. GIVE EID CLOTHES: For drop-off locations, email info@mwo-orlando.org. Remember, this is for families to wear on Eid! ONLY formal attire in excellent condition will be accepted. VOLUNTEER: Sign up to help assemble the C.A.R.E. packages by clicking here or emailing volunteer@mwo-orlando.org. SPREAD THE WORD: Share our campaign with your family and friends. The Muslim Women's Organization (MWO) is a non-profit 501(c)3 charitable organization dedicated to empowering women and improving lives. MWO was founded in October of 2010 by a group of women who recognized their potential to make a positive impact in the community. MWO envisions a world where every Muslim woman has the opportunity to lead in the service of humanity. MWO’s mission is to provide Muslim women the opportunity to enrich their lives through community service, outreach and personal development. We accomplish this by supporting existing community initiatives and creating new projects that provide opportunities for women and their families to get involved and make a difference. Muslim Women's Organization has partnered with Give Lively to securely process your online donation. This transaction will appear on your credit card statement as "Muslim Women's Organization". This transaction is subject to Give Lively's Terms and Privacy.